Hello friends! 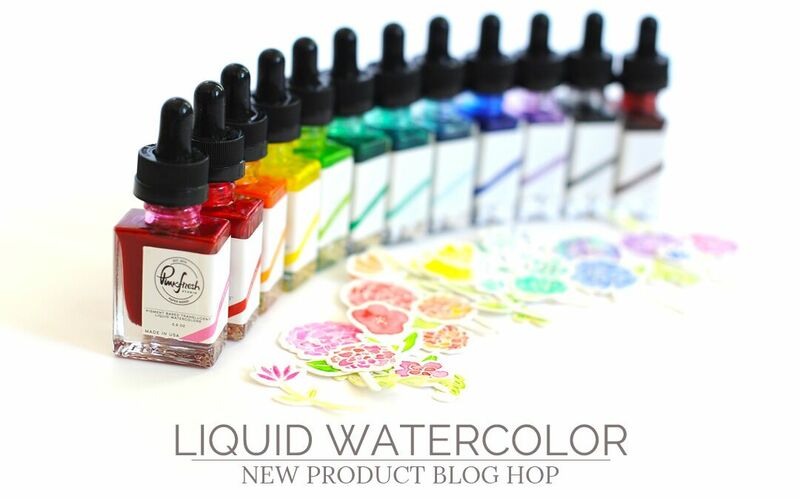 I'm super excited to be a part of the Pinkfresh Studio Liquid Watercolor Blog Hop! Check out these gorgeous new paints...aren't they gorgeous? There are 12 colors, and they are so bold and beautiful. There are lots of designers taking part in this Hop, and you know that means LOTS of GIVEAWAYS! So stick around the end of this post for the full list. You'll want to visit each blog and leave comments to be eligible for the prizes! But first, here is the layout I created using the new colors and the Be You collection. I used lots of the patterned papers with the Flutterby cut file from The Cut Shoppe. I think this is a great color scheme to show how you can really lighten up the watercolors by mixing and matching and adding lots of water. I used a lot of gesso on the background first and then used some of the blues, aquamarines, black, red, pink and oranges. I used some of the 6x6 Paper Pad papers under each butterfly. I stitched through the center of the half circle. I used some of the chipboard behind the photo and for my title piece. I sorted through the puffy stickers and ephemera die cuts to create a cluster around the title. I added lots of foam under the title piece to raise it up off the page. I tucked in some grey and aqua thread there as well. 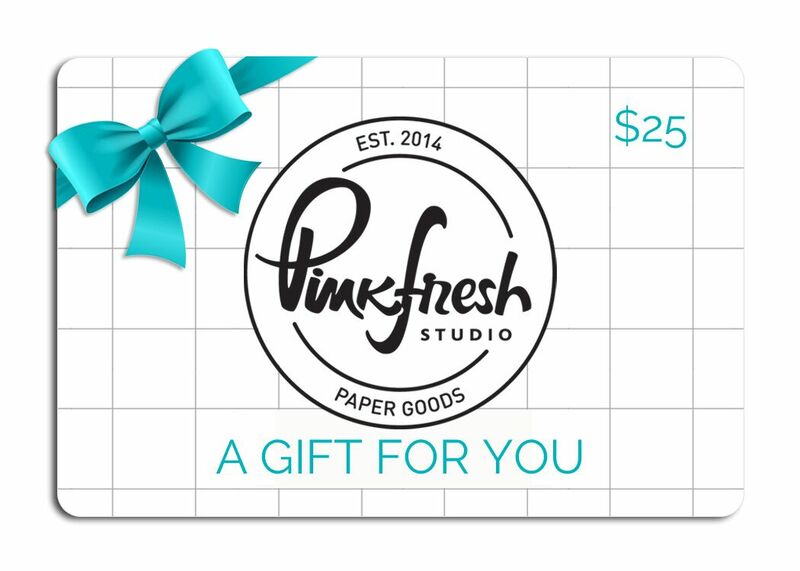 Pinkfresh Studio will be giving away a full set of the Liquid Watercolors on the blog, on the PFS Facebook page and on the PFS Instagram page, so go leave comments there! Also, leave a comment on each designer's blog. We are ALL giving away a $25 Gift Card to Pinkfresh Studio! Woo Hoo!! Winners will be posted on the PFS Giveaway Page on Sunday, June 10th. You must visit this page and claim your prize WITHIN 2 WEEKS. Thank you so much for participating in the Hop! I appreciate you stopping by. Have a great day! I love your layout and the colors you used are exquisite! This is so sweet and beautiful! Loving the watercolors! That backgroud is gorgeous! I love the way you combined the colors. Love to see your spin on any new products!! What a lovely layout, can't wait for the watercolors release. I love your layout and the textures and layers. So pretty! A very nice layout and great use of the new watercolors! Thanks for sharing. Love the muted colors you created! Beautiful layout! Beautiful layout, love the colours. Thanks for sharing your process. I totally love the combination of colors you used😍😍😍 Amazing as always! gorgeous layout! :) the bits and pieces and the watercolor background is so pretty! looks beautiful !!! cant wait to watch your video!!! Gorgeous layout and I love all your dimension and layers. So pretty with this gorgeous watercolor. Was it hard to watercolor on this paper? You did a wonderful job and did you have to test it out on another sheet before you did or did you just go for it? I really like your layout and how you added all the fun accents to compliment your colors. Thank you! Pretty! You really did an amazing job combing these colors! Your layout page using the new liquid watercolors is so lovely! Your LO is very pretty Missy, love the soft colors. Thanks for the inspiration! Beautiful layout! I like the soft muted colors & the combo of the chipboard, ephemera, puffy stickers, etc..Thanks so much for sharing! Loved on your video where you talked about how to take these bold, vibrant colors down a notch; so versatile! Gorgeous layout. I love the muted colors. It just softens the whole page. What a fantastic layout Missy. Love the pale colours of the w/c's and those butterflies look so amazing. Well done! L♥VE IT! Absolutely gorgeous layout Missy, as usual! Love watching you create! Love how vibrant those liquid watercolors are and how lovely they are toned down! Thanks for all the great inspiration you give in your videos! Wonderful page and video! Love the soft colors. Love all your videos! You always inspire me!! I am getting more confident in my messy :)! Gorgeous page!! Thanks for what you do!! Sweet layout!! Love the colors you used!! Gorgeous! I love how you diluted them to make the colors soft! So pretty...love your color choices! Great layout and beautiful colors. Thanks for the inspiration. I love how you were able to pick and mix colors that match the papers so well. What a fun and colorful layout. The theme matches the picture perfectly. What a pretty color combo and stunning layout!!! All those little details just add so much! Thanks for sharing! So perfectly sweet! Amazing details and layering. The watercolors so beautifully enhance your photo. Fantastic layout. I so loved your card. Love your Beautiful and creative layout. Love your color choices! great layout! Precious layout and the soft water color background is perfect! Your layout is gorgeous! I love the mixture of colors you used! This scrapbook layout is just beautiful with all the soft greens and the gingham (I just love gingham!). Great job! Lovely page! Thank you for including a video. Can't wait to check it out. Its so lovely that with these inks everyone find her stlye! Loved the layout and butterflies just so pretty. So pretty. I like the colors and the circular design with the butterflies. I love how you demonstrated toning down these colors! Great page, as always! Love this! And I really enjoyed your video as well!! Love this layout and the video! Your watercolor work always amazes me. Absolutely LOVE this layout and all that texture! Wow! Love all of the layering. Oh wow, love your scrapbook page and thanks so much for the process video! pretty and full of life! I love all the details that you added. From the string to the sewing, you did a great job. Super sweet layout. Love that the bold colors can be subtle by just adding water instead of buying a bunch of colors in the same color family. Lovely layout and amazing watercolors ! Beautiful layout! I enjoyed watching your process from start to finish. I have so much to learn about watercoloring. I love the butterfly wreath and the selection of colors you used in your project! Such a beautiful layout with a pretty palette. Love the asymmetry and stitching details. Soooo pretty. I love how the water color looks and the stitching used on layout. What a great effect!!. Love it. Thanks for inspiring. This layout is amazing--so gorgeous! Gorgeous layout with so many gorgeous colors and textures. Love the background you created! Such a beautiful and unique colour combination. Thanks for sharing your art with us. What interesting tones and textures you got out of these watercolors! Thanks so much for sharing this with us; this gives me lots of ideas I didn't have before. Just gorgeous! I love how you used the watercolors on your page - incredible depth and texture. So fun! Thank you for the ideas and sharing your inspiration! So much lovely layering on this fab project. Thanks for sharing the technique video. It was fun to watch your video and see how the page progressed. So many layers that you used. The soft colors are really pretty. TFS. Wow !! You’ve made a magnificent layout !! Your work is soooo beautiful! Love the pretty design! Such a sweet layout - love all the dimension and the soft colors. Beautiful layout. Love your sweet sentiment too. Loving all the pretty colors! Awwww! Such a sweet, sweet layout! Beautiful, I love all the layers. Unique and artistic! Love it! Amazing as always Missy! Just love how you used the watercolours! great layout, I love how you use the watercolors. Beautiful layout! And the watercolors - so bright and vibrant, and easy to use! Beautiful layout! Love that half wreath design. The watercoloring is beautiful and I love the dimension on those butterflies! Super fun layout!!! Those little hearts just make it perfect!!!! I love the beautiful layering on your layout. The butterflies are beautiful!